The second chapter of Conversations with Spirits (still live on Jottify.com) is titled ‘The Redoubtable Harry Price’. 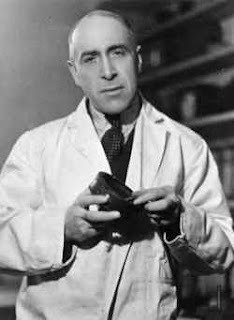 Harry Price was a real-life figure, and famous (in his lifetime, at least) as a ‘psychic investigator’. By the 1930s, no radio broadcast or newspaper / magazine article about an alleged case of haunting was complete without a contribution from Price. He was also a talented and prolific writer, producing hundreds of newspaper articles and several best-selling books. An accomplished conjuror, engineer and photographer, he sat with countless mediums, investigated thousands of apparently ‘haunted’ places, founded a National Laboratory for the scientific examination of psychic phenomena and amassed the greatest collection of occult literature in the world. Price was also a controversial figure, however, and was regularly accused of fraud and deception in his own investigations. Here is Harry Price talking about his psychic library (whilst smoking endless cigarettes, naturally).